Objective: to foster better relationship among members of the Eng Teng (Yongding) clan, to promote industrial and commercial development, and to organize charitable, educational and welfare projects. 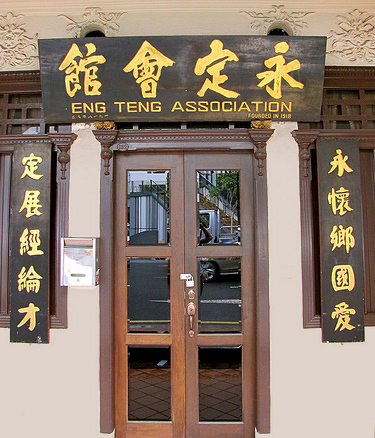 The Eng Teng Association of Singapore is the earliest clan association set up by Yong Ding county clansmen residing in Southeast Asia. In the early 20th century, as more Yong Ding immigrants moved to Singapore, there arose a common desire to form an association to act as a focal point and a base to keep in touch with fellow clansmen. The prime-movers were Hu Bi Yu, Ju Xiu Rong, Zhang Zi Lou and Hu Xing Jie. Initiated by them, fellow clansmen held a general meeting on 26 December 1916 and it was resolved that an Association be formed based on geographical tie. Concurrently, a shophouse at Neil Road was purchased as our premises. On 14 March 1918, its application for registration was approved by the government and the association was officially set up. The Association then started a drive to recruit members and to raise a building fund. With strong support from fellow clansmen, the Association bought No 361 New Bridge Road as the new premises in 1919. The premises was officially opened in 1922. Initially, the Association was the general association for Eng Teng clansmen in Southeast Asia. All operations came to a halt during the Japanese Occupation. The premises became a refugee camp to accommodate unemployed clansmen. After the war in 1945, a general meeting was soon called and elected Aw Kow (Hu Jiao) as the president. He was responsible for reviving the Association through a member re-registration campaign, and raising funds to renovate the premises. In 1946, the first issue of the Eng Teng Monthly was published. The Association was the forerunner of clan associations in Southeast Asia which had their own publications. However, the Monthly ceased publication in November 1947 for publishing commentaries on current affairs and anti-establishment articles. The Association formed a mutual aid section in 1951 and a scholarship and study loan committee in the 1970s. Since 1975, scholarships, study loans and bursaries have been given out to deserving members and their children. As more people joined as members, the premises became inadequate and so in March 1970, under the leadership of our president Hu Lang Man, a building fund-raising campaign was launched. It received good response from fellow clansmen in Singapore and Malaysia. In the same year, the Association bought a three-storeyed house at No 19 Dunman Lane in the Katong area as the new premises. As approval was not granted by the Government for it to be used as premises of an association, in 1980 the Association bought shophouses at No 128, 130 and 132, Neil Road as premises. The Association moved to the present premises at No 132 Neil Road in 1985. On 24 August 1985, the Association hosted the first Singapore and Malaysia Eng Teng clansmen convention. The fellow clansmen from Perak and Penang were particularly enthusiastic and many of them came to attend the convention. At the same time, the Association organized a table tennis team which went on a tour to many places in Malaysia to have friendly matches with its counterparts. In 1987, the Association started distributing Lunar New Year hongbao. On 21 October 1988, the Association celebrated its 70th anniversary, which was attended by many overseas delegates. A souvenir magazine was published to commemorate the event. In the 1990s, the Association further enhanced the operations. Activities such as special banquets in honour of senior citizens and sightseeing tours are organized regularly. In 2000, the inaugural issue of the Eng Teng Bulletin was published to update clansmen about the Association’s activities and news on home villages. The Association is a corporate member of the Nanyang Khek Community Guild and the Hok Tek Chi Loke Yah Teng Association. Lunar New Year hongbao – Each year it distributes hongbaos to senior citizens to express its respect for the elderly. Scholarships – During the Spring sacrificial offering, primary, secondary, and tertiary scholarships are given to members’ children who excel in both studies and conduct. Spring and Autumn sacrificial offerings – During the Spring and Autumn festivals, ancestral worships are performed at the Fong Yun Thai (Feng Yong Da) ancestral temple. A banquet is held in the evening for members and their families. Clan ties – The Association has participated regularly in all Hakka international conventions as well as the Singapore and Malaysia Eng Teng clansmen conventions. The Association has also formed delegations to visit fellow Yong Ding associations in other countries such as Malaysia, Macao, Hong Kong, Taiwan and China. The Association has also regularly received delegations from overseas. Food Fairs – Annual food fair is held to entertain the elders with hometown delicacies. Hongbao and fagao are distributed to them.